Each year I visit New York City as a committee member for James Beard Awards.. Our committee is always looking for great places for breakfast. I had heard that The Society Café attached to the Walker Hotel had wonderful breakfasts. Don’t miss a chance to visit this charming breakfast venue. It really is worth it. 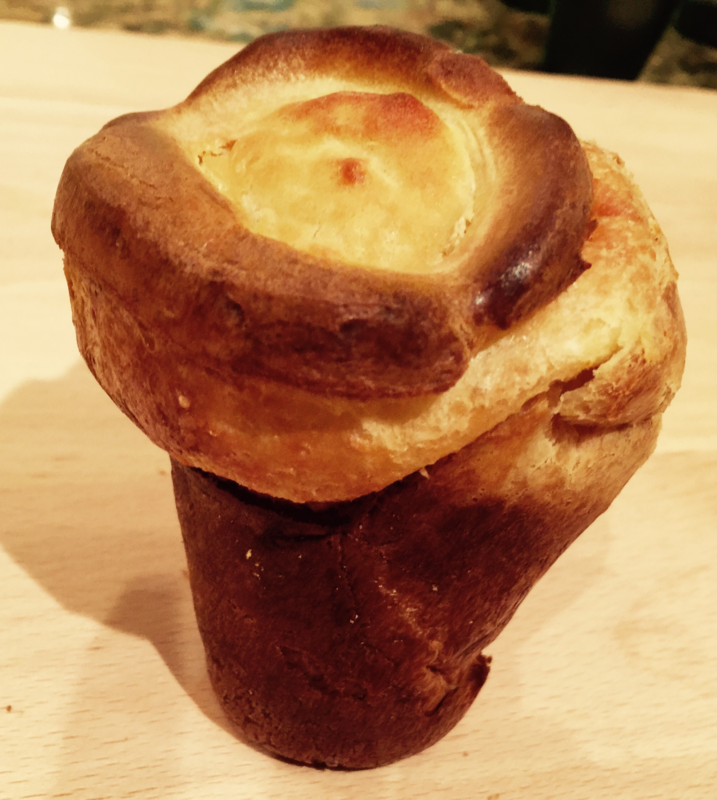 We were served tender, light yet crispy popovers– the American version of English Yorkshire Pudding. Puffed and golden brown, these perfect popovers became my gold standard. I noticed that the chef’s recipe called for warm milk that seemed unusual. And then I stumbled on my dear friend and colleague Marlene Sorosky’s Over the Top Popover recipe. Marlene is one of the most accomplished cooking teachers in the USA and has written many cookbooks. She tested this over 25 times to get it to her satisfaction. Her popover recipe, which is similar to the chef’s at Society Café, tells the reader that adding hot milk to the batter allows the eggs to stablize and support the batter. She bakes them at 375F for the whole time and only heats the pans for a couple of minutes prior to pouring the batter into the tins. Her best tip is that you can make them in advance and hold them up to 4 hours— all they need is a quick reheat. She actually thinks they are better! You can find a few other popover variations at https://www.cookingwclass.com. I love to serve these for breakfast with cherry or apricot jam and sweet butter. They are also a delcious accompanimemnt to a brunch egg dish or for lunch. Frankly there is never a bad time to induldge in these airy, crispy, golden brown puffs of goodness. This recipe makes 6 large popovers in a standard popover pan or 10 smaller ones in a mini popover pan, standard muffin tin, or 1/2 cup custard cups. Heat the milk in a saucepan until bubbles appear around the edges of the pan. Or, heat in a microwave until hot, but not boiling. The hot milk allows the eggs to stablize and support the batter. Mix the eggs in a mixing bowl with an electric mixer, by hand with a whisk, in a blender or a food processor, until frothy. While mixing, gradually pour in the hot milk. Add the flour, salt and sugar; mix on low until thoroughly incorporated, scraping down the sides as needed. Mix in the melted butter, if using. Cover and refrigerate at least 1 hour or up to 24 hours. Position a rack in the middle or lower third of the oven. Preheat a conventional oven to 375° or convection oven to 350°. Place the popover pan, standard muffin tin or custard cups in the oven for 2 to 3 minutes. Remove from oven and spray the sides and top edges of cups with pan spray. Whisk the batter well and divide among the cups, filling almost to the top. Bake until puffed and deeply browned, 35 to 40 minutes for small popovers, 45 to 50 minutes for large ones. The longer they bake, the less they will deflate when you take them out. If they are browning unevenly the last 10 minutes, rotate the pan. Remove the popovers from the pan and serve immediately. Or, for crisper popovers, remove them to a rimmed baking sheet where they can be held uncovered for up to 4 hours. Before serving, preheat the oven to 450° and reheat for 3-5 minutes or until hot and crispy. Sweet peas and sugar snap peas are the foundation of this chilled soup. Butter lettuce lends an interesting sweet flavor and thickening texture to the soup. Influenced by the classic French braised peas and lettuce dish, this soup is a cup of green comfort when it’s hot outside. Try to cook this in the morning before the kitchen becomes too hot and then chill it for either lunch or dinner. Sometimes I like to serve this in little cups or shot glasses instead of a traditional appetizer. It is also nice as a first course soup. This garden green blend of sweet lettuce, mint, sugar snap and baby peas seem made for each other. If you can find fresh, just-picked peas use them. Look for small peas for best flavor. Sometimes, if the peas are too large or older than a few days they will be starchy and even slightly bitter. To make it Seriously Simple and ensure a tasty result, prepare the soup with frozen petit peas that have been defrosted. Remember they don’t need much time to cook so adjust the time (see step 2). Fresh mint is a wonderful complement to the flavor of peas. There are many varieties of fresh mint such as lemon, pineapple, orange, spearmint and even chocolate. Look for a simple mint that will work best in this recipe. If you want to have mint on hand at a moments notice try growing it in a pot on your windowsill or in your yard. It’s best to grow mint in pots because mint has a way of taking over your garden. You can also serve this as a hot soup. Heat the oil in large saucepan over medium heat. Add scallions and saute, stirring occasionally, for about 3‑5 minutes or until softened. Add lettuce and saute until it is wilted, about 5 minutes. Add the mint, stock, sugar snap peas, and the shelled peas (if using frozen, defrosted peas, add during the last five minutes). Cover and simmer fifteen to twenty minutes, or until the sugar snap peas are nicely softened. Add salt, pepper and lemon juice. 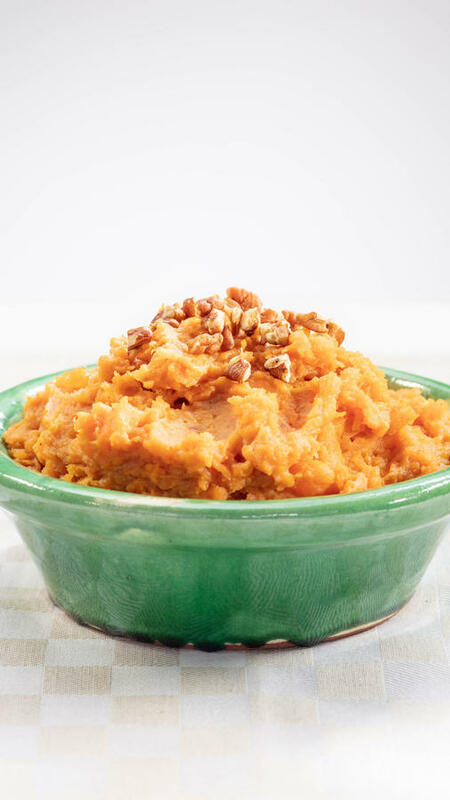 Place the soup in a blender process until pureed. Transfer to a bowl, taste for seasoning and cover well. There is nothing like a Fourth of July barbecue. Kids and adults love the patriotic fanfare as well as the smoky-sweet barbecue aroma in the air on this special day. I think I have made the gamut of dishes that somehow have come to signify Fourth of July. From southern pulled pork to ribs of every kind, I’ve kicked up the flavors and reimagined grilled sausages, burgers of every kind, steaks, and salads galore. When I want a simple menu I like to offer my standard juicy beef burgers and add one other burger to satisfy the non-meat eaters at my gathering. This Ahi Burger with Ginger Sesame Mayonnaise is a true crowd-pleaser. Fresh tuna has become a staple at most supermarkets. Select tuna that is very fresh and doesn’t have a bloodline running through it. The tuna is finely chopped by pulsing it in the food processor with plenty of garlic and fresh basil. Once refrigerated and firm, they are grilled until medium. You can double or triple this recipe but do it in batches. Sometimes I add a slice or two of avocado on top of the lettuce. Make sure the burgers are not overcooked or they will be dry. To round out your meal consider adding your favorite coleslaw or potato salad, grilled fresh corn on the cob and a fresh fruit platter for a colorful menu. You can also sauté the burgers in a large skillet over medium-high heat if weather isn’t cooperating for barbecuing. And another variation is to make these into sliders (about 3 inch min-burgers with mini-buns) and serve as an appetizer. I also love to serve this ginger sesame flavored mayonnaise as a dipping sauce for a vegetable platter (crudités) that includes carrots, pea pods, baby tomatoes and asparagus. Raise a glass of chilled Rose to celebrate our country’s independence and enjoy your day. In a food processor, mince the garlic. Add the tuna, olive oil, basil, anchovy paste and pepper and pulse until the mixture resembles the texture of ground meat. Divide the mixture into 4 balls and form them into 1-inch-thick patties. Place on a waxed paper-lined baking sheet. Cover and refrigerate for at least 30 minutes. To prepare the mayonnaise: In a small bowl stir together the mayonnaise, sesame seeds, sesame oil, vinegar; and ginger; season with the hot pepper sauce. Cover and refrigerate until ready to use. Heat the grill to medium high heat with a perforated grill sheet on top that has been sprayed with non-stick cooking spray. Place the tuna patties on the grill and cook for about 2 minutes on each side for medium. To serve, spread a tablespoon of mayonnaise on the bottom half of the toasted buns. Place the lettuce leaves on top. Place the burgers on top and dollop a tablespoon of the mayonnaise on the burger. Cover with the bun tops. Serve immediately. Advance Preparation: May be prepared through step 2 up to 6 hours ahead. Keep the burgers and mayonnaise covered and refrigerated. The traditional method requires cooking the potatoes twice. The first cooking time sets the potatoes and cooks them inside. The second cooking time finishes cooking the potatoes and makes them crisp and golden brown. Don’t crowd the potatoes because this will bring down the frying temperature and make the French fries too oily. Remember the temperature goes down as soon as you add the potatoes which is why it may take a few more minutes for the first frying. You’ll also find methods for frying shoestring below. While the recipes here recommend peeling the potatoes, you may prefer a more rustic presentation with the peel on. Either way they’re delicious. There a number of ways to cut the potatoes: try the French fry cutter disc on the food processor, any of the French fry gadgets or a very sharp knife. If you like to dip your fries why not try a garlic mayonnaise instead of ketchup? Or offer both if you can’t decide. Serve these on a plate or in a basket. Peel the potatoes and cut into 3/8-inch by 3/8-inch by 4-inches. Cover in cold water for a few minutes to remove excess starch. Heat about 3 inches of oil to 330 F in a deep fryer with a basket or in a heavy deep pan. If you don’t have a deep fryer use a deep-fry thermometer to register the temperature. If you don’t have a basket to keep the fries together use a pair of long tongs to remove them from the oil. While the oil is heating dry the potatoes carefully with dishtowels. (Wet potatoes splatter and may stick together.) Immerse the basket in the hot oil to avoid the potatoes sticking. Remove the basket from the oil. Place 2 cups of potatoes at a time in the basket or in the pan and lower into the oil. The oil will expand and cover the potatoes. Fry for about 4 to 5 minutes or until the potatoes are light yellow but have not started to brown. Adjust the temperature so it stays at 330 F. Make sure that you do not crowd them. Remove the basket over a bowl to drain and then set aside for at least 10 minutes. These may be held at room temperature for up to 2 hours. Right before serving heat the oil to 370 F and fry the potatoes, in batches, for about 3 to 4 minutes or until golden brown and crisp. Remove the basket and drain over a bowl. Transfer and drain on paper towels. Place in a serving bowl or basket, season with salt and serve immediately. Shoestring Potatoes: These are only cooked once. Cut peeled potatoes into skinny (1/4-inch by 1/4-inch by 3-inches) strips. Cover in cold water for a few minutes to remove excess starch. Heat the oil to 375 F. While the oil is heating dry the potatoes carefully with dishtowels. (Wet potatoes splatter.) Add the potatoes in batches, (1 potato at a time) stirring with long tongs to make sure they don’t stick together. When golden brown, remove the basket over a bowl to drain and then turn out on paper towels to blot the excess oil off. Place in a bowl or napkin-lined basket, season with salt and serve immediately.